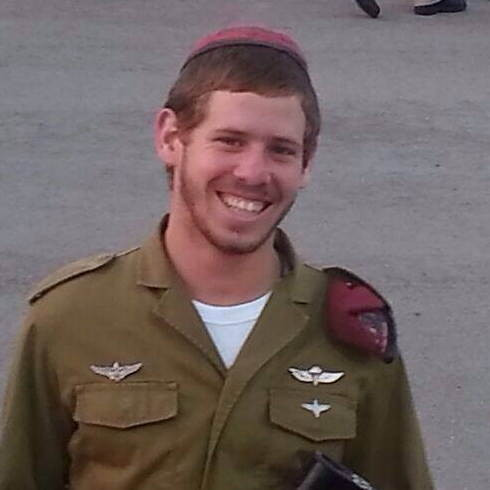 August 31, 2014 - Sergeant Shachar Shalev, who was seriously wounded in a firefight in Khan Younis only six days into the IDF's ground incursion into Gaza, succumbed to his wounds on Sunday. The paratrooper, 20 years old from the Golan Heights moshav Alonei HaBashan, has been fighting for his life for five weeks. He lost both his legs after being seriously wounded in a July 23 incident that also claimed the lives of Staff Sgt. Lee Matt, Staff Sgt. Shachar Dauber, and Lt. Paz Eliyahu. The doctors were forced to amputate one of his legs while he was unconscious and on life support at Soroka Medical Center in Be'er Sheva. About 10 days ago, when gangrene began to spread through his muscles, doctors had no choice but to amputate the second leg. Last Wednesday, Shalev was transferred in a pressure chamber to the Rambam Medical Center in Haifa. At the time, his parents expressed optimism their son will pull through. "According to what the doctors say, it looks like it's going to be okay," Shalev's father, Shimon, said. "The treatment in the pressure chamber improves the odds of recovery." Shimon went on to say he hoped after Shachar's second leg has been amputated recovery would be faster. "The doctors are optimistic so we're optimistic," he said. Last week, Shalev's family called on the general public to donate blood platelets for the brave soldier - the response was so overwhelming that Rambam announced after only three hours that no more donations were necessary.